FB Purity v13.4.1 has been released! 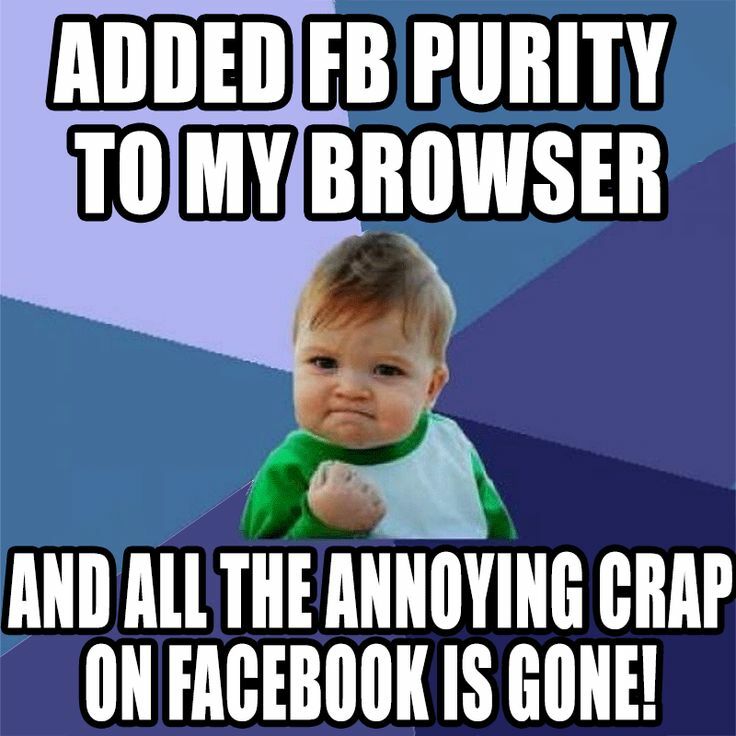 Added FB Purity to my browser and all the annoying crap on Facebook is gone! Fixed: “Changed location” newsfeed filter, this filter wasn’t working very well previously. Now it should hide all Check-in type newsfeed posts that feature a map. Fixed: Selecting the “Top Stories” menu item when you had the “Sort feed: Most Recent” option turned on, was not working correctly. This is fixed now. Fixed: With the “Sort Feed: Most Recent” option switched on, sometimes when attempting to go to a notification, it would instead take you back to the newsfeed after showing the “Switching Sort Order to Most Recent” message. New: “Hide Group Conversations” in Chat (Sidebar) option. Previously the hide offline friends option would also hide the group chats, this is now fixed, and theres now a separate option to show/hide group chats. This option is located under the “Chat Options” heading. New: Friends Feed and Photos Feed newsfeed menu options (under the Newsfeed dropdown menu at the top left of the newsfeed page). The friends feed is basically just stories from your friends, (no fan page stories and it doesn’t seem to have the issue of showing posts out of order, like the “Most Recent” feed does), the photos feed, is just photo stories from your friends. N.B if your net connection is quite slow, these menu options won’t show up due to a currently unresolved timing issue. This entry was posted in Facebook, FB Purity and tagged block facebook ads, browser extension, chronological newsfeed, clean up facebook, customise facebook, Customize Facebook, Facebook, facebook ad blocker, Facebook Customization, Facebook Newsfeed, facebook purity, FB, FB Purity Update, FBP, FBP Update, fluff busting purity, Friend Tracker, friends feed, hide facebook ads, hide people you may know, hide sponsored posts, hide sponsored stories, hide suggested pages, hide suggested posts, hide trending, most recent, newsfeed filtering, photos feed, remove facebook ads, sort newsfeed by most recent, Unfriend Finder, who unfriended you. Bookmark the permalink. Need help. I cannot find an “unfriended archive” (sic), a list of “friends” who “unfriended” me. Does this exist? How to get to it? How do I completely get rid of the friends feed? I checked the box to to completely get rid of newsfeed but that is still popping up. Thanks! How to I get to Friends feed ?? mine keeps saying “switching to friends feed” everytime I visit facebook. its slow and annoying. how do I turn this off?